Personalized Shot Glasses Custom Printed in Bulk, Acrylic. Promotional, Cheap. Budget Prices for USA, Canada. 2 oz. Clear, Blue, Purple, Yellow, Red, Glow Green. Bulk acrylic shot glasses, personalized with your logo and with optional steel base (add $0.10 per item for the steel base). Best price in USA and Canada for wholesale personalized shot glasses. Free artwork design. We will send you a proof for your approval before production. Prices below include your 1-color custom imprint. You may order any quantity above the minimum. SETUP CHARGE: $45.00 per imprint color. Extra imprint colors are not available. SIZE: 2 oz. 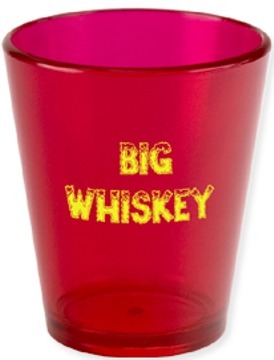 Other sizes of custom imprinted shot glasses are also available: contact us. COLORS: Clear, Translucent Blue, Translucent Purple, Translucent Yellow, Translucent Red, Edge Glow Green Assortment is allowed. PRODUCTION TIME: 5 days after art approval. Add 5 more days for delivery in Canada.